The Breitling Emergency is an instrument wristwatch designed for professionals, to aid in emergency situations by sending out a dual-frequency signal (121.5 MHz and 406 MHz) distress signal and acting as a beacon to aid in search and rescue in any number of emergency scenarios where being located could mean the difference between life and death. The technology uses a miniaturized radio transmitter – including an antenna that can be extended out of the large crown located on the bottom right lug of the case – to increase the range of the homing beacon. The Personal Locator Beacon works with the International Cospas-Sarsat satellite system and can both trigger alerts and guide search and rescue operations. The Breitling Emergency Night Mission is powered by a Breitling SuperQuartz chronograph movement, which is ten times more accurate than standard quartz. 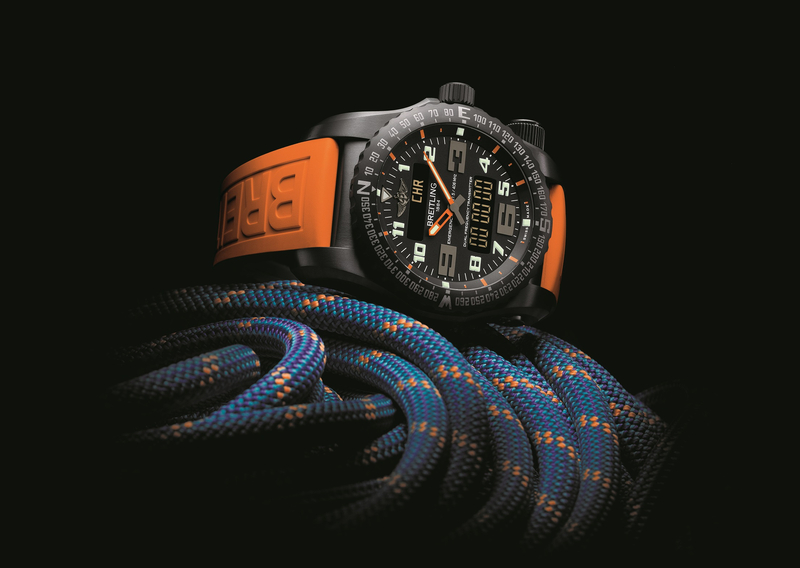 And now, there are three special editions of the Emergency that come in matte black titanium cases, with orange accents, yellow accents, or a blue mother-of-pearl dial. The case measures 51 mm in diameter. Water-resistance is 500 meters. Each version comes with a rubber strap.